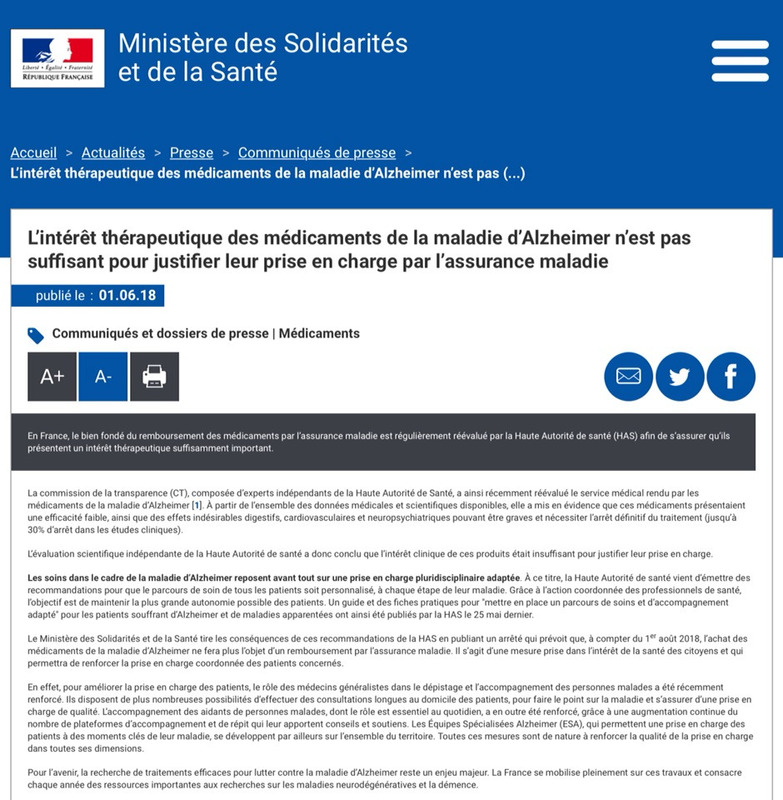 In France, the legitimacy of the reimbursement of medicines by health insurance is regularly reassessed by the High Authority of Health (HAS) to ensure that they have a significant therapeutic interest. The Transparency Commission (CT), made up of independent experts from the High Authority for Health, has recently reassessed the actual benefit of drugs for Alzheimer's disease . Based on all available medical and scientific data, she has shown that these drugs have a low efficacy, as well as digestive, cardiovascular and neuropsychiatric adverse effects that can be serious and require the definitive cessation of treatment (until at 30% stop in clinical studies). the clinical interest of these products was insufficient to justify their care. Care in the context of Alzheimer's disease is primarily based on appropriate multidisciplinary care. As such, the Haute Autorité de Santé has issued recommendations to ensure that the care path of all patients is personalized at each stage of their illness. Thanks to the coordinated action of health professionals, the goal is to maintain the greatest possible autonomy for patients. A guide and practical fact sheets to "set up a path of care and adapted support" for patients suffering from Alzheimer's and related diseases were published by the HAS on May 25th. This is a measure taken in the interest of the health of citizens and which will strengthen the coordinated care of patients concerned. to improve the care of patients, the role of general practitioners in screening and accompanying patients has recently been strengthened. They have more opportunities to carry out long consultations in patients' homes, to take stock of the disease and ensure quality care. Caring for caregivers of sick people, whose role is essential on a daily basis, has also been strengthened, thanks to a continuous increase in the number of support and respite platforms that provide them with advice and support. Specialized Alzheimer's teams (ESA), which provide care for patients at key moments in their illness, are also developing throughout the country. All these measures are likely to strengthen the quality of care in all its dimensions. For the future, the search for effective treatments to fight against Alzheimer's disease remains a major challenge. France is fully engaged in this work and devotes significant resources each year to research on neurodegenerative diseases and dementia.